Disturbing video has captured the violent attack of a 10-year-old girl as she entered her apartment building. 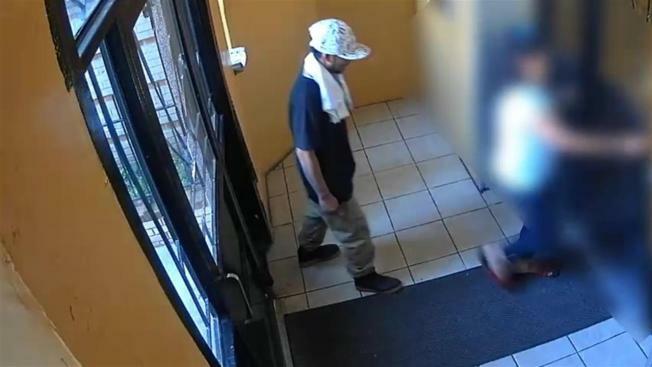 The girl was going into her building on May 25 at about 4:50 p.m. when the man spotted her, and stalked her into the entrance of the building. Surveillance video shows the man slipping through the doors after the young girl, and hanging behind her, watching. As she goes through the second set of doors the man violently grabs her and yanks her back. He throws her to the ground and grabs her iPhone 7+, before finishing her off with a kick to the face. The horrific attack happened in the vicinity of Holland Avenue and Pelham Parkway North in the Bronx. Police are now asking for the public's help identifying the man. Anyone with information is asked to call police on 1-800-577-TIPS.